Home › Announcements › Monmouth Herald – More Added! Monmouth Herald – More Added! Thanks to a partnership with the Monmouth Public Library, and funding from the Polk County Cultural Coalition and Monmouth Friends of the Library, even more issues of the Monmouth Herald have been added to the Historic Oregon Newspapers website! 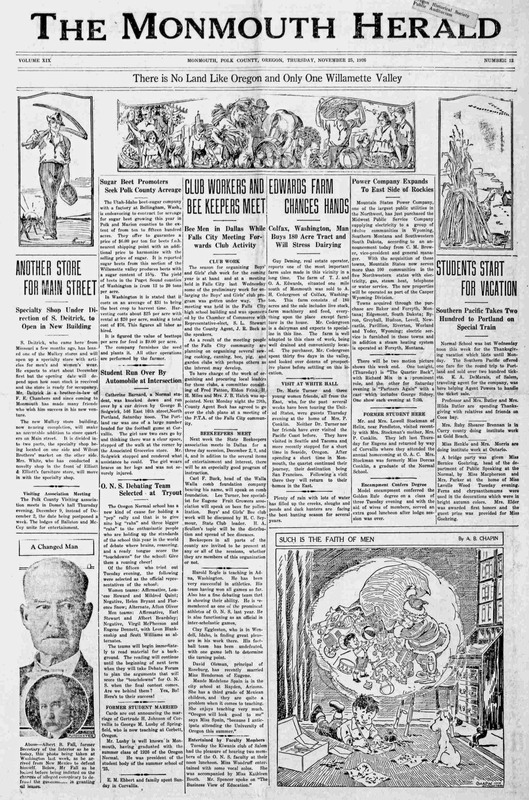 In print from 1908 through 1969, the Monmouth Herald kept the people of Monmouth, Oregon, informed, reporting on local, national, and international news events. The newspaper came out on a weekly basis until its last issue, published on June 26, 1969. Its publisher was Acorn Press. The Monmouth Herald can still be read, researched, and enjoyed, with issues available for free online at the Historic Oregon Newspapers website. Additional issues of the Monmouth Herald now up on the Historic Oregon Newspapers site range in date from September 4, 1908, through March 24, 1927. As with all newspapers on Historic Oregon Newspapers, each issue of the Monmouth Herald can be searched by keyword because of optical character recognition (OCR) technology. In addition, each issue of the newspaper can be downloaded and saved as a PDF or JPEG file, at absolutely no cost to visitors to the Historic Oregon Newspapers website. Check out these additional issues of Monmouth Herald on Historic Oregon Newspapers today! ‹ More Historic Morrow County Newspapers Added!